HP updates the Envy with sleek lines, an improved hinge & compact size. However, it's let down by a poor screen, finicky touchpad and odd on-board hardware. Sitting in the 'Performance Home' category on HP's website is the HP Envy 15. We tested the 15-ae001na model, which comes with a 15.6-inch widescreen as its name suggests. The screen size means the base can fit a traditional number pad on the right-hand side which reduces its portability. The HP Envy 15 sits halfway between a cheap student workhorse, a very low-end gaming laptop and an office laptop. It's suitable for families who need a jack-of-all-trades machine that can take a bit of a beating; it can do a spot of gaming, watch DVDs and surf the web too. It would equally suit students who mainly sit in libraries or at home churning through research papers. While it's not a touchscreen model, it's comparable with Levono's latest office workhorse Thinkpad Yoga 15. However, HP's inclusion of four USB 3.0 ports, a DVD burner and an ethernet port could sway some users but could equally put others off who prefer simplicity and regard their inclusion as surplus to requirements. The Dell Inspiron 13 7000 is smaller, cheaper and features a touchscreen, and we think students would be best looking at this model. Our test system came with Windows 8 installed, several menus and a extended reboot later we installed Windows 10. The process was smooth, but it's a pity it wasn't pre-installed. Windows 10 is a huge improvement on 8 and since the Envy isn't touchscreen it benefitted from the new streamlined OS. Build-wise the HP Envy 15 can take the everyday knocks likely to be encountered when moving it from place-to-place. Its backlit keyboard sits slightly indented into an aluminium surround with clean and smooth lines. On the bottom right-band corner there's a fingerprint reader which saves you having to remember and type in passwords. It's powered by HP's SimplePass software which is surprisingly light and intuitive – you won't notice it's running most of the time. Located on the right-hand side of this model is a DVD burner. It seems strange now in late 2015 to have one of these as they take up so much space. External drives are quite cheap these days and most software and music can be streamed or downloaded, so this feels like a legacy device. Some users may find a use for it, perhaps workers who get information sent securely on CD, or families with a large DVD collection and scant internet coverage. There's another possibility, namely that it's been put in there to appeal to older computer users unwilling to give up on the technology just yet. Also in the base is a set of four Bang and Olufsen speakers with a sub woofer tucked away somewhere in there. This makes for a powerful on-board sound that's both good at the top-end, and there's a certain amount of bass there too. The HP Envy 15's large size means it's not something you'll be slinging in and out of a bag or having on your lap for long periods of time. This is more of a home laptop not designed for travel. I had a few issues with the touchpad as it would often start making selections rather than just moving the cursor across the screen. It wasn't a consistent problem but it did make simple tasks such as web browsing and writing this review frustrating. Our review model featured a WLED full HD screen (1920 x 1080) with anti-glare. The screen is one of the weakest points, sadly – looking at it from anything other than straight on renders the colours dark and essentially un-viewable. The lack of a wide viewing angle does somewhat negate part of the need for a larger screen as you won't be able to share it with others while watching DVDs or movies. At high brightness the colours are garish – the display's advantage is its size, but we'd recommend going for a model with an IPS screen. 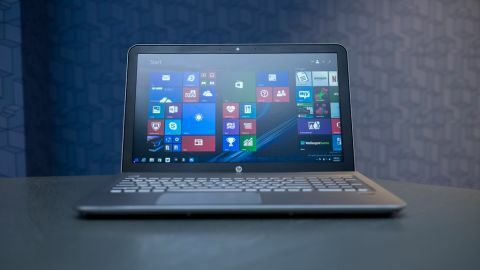 The 17.3-inch versions come with that option and there are rumours that there will be an IPS 15.6-inch version, but there's no mention of it on the HP website so far.